Today is Kim Il-sung’s birthday. Long live the great leader! If you’re following the news and what’s happening in the Korean peninsula, you might get a sense of deja vu. Because truth be told, this posturing by Pyongyang has become like a vicious cycle that it was even in the news how South Koreans have become blase about it. Now, if you’re also watching IRIS 2–which ends this week–then it’s double deja vu because there are times that the reel happenings on screen mimic that of what’s going on for real. I have read reviews about IRIS 2 and most of them are complaints and criticisms on how bad it is compared to the original with Lee Byung-hun and Kim Tae-hee. I’m not really a fan of sequels, especially when there’s a new cast involved, so I also approached IRIS 2 with a degree of wariness, prepared to get disappointed somewhere along the way. But for all my complaints–there are gaping plot holes all over the series–it’s an engaging production and should be judged based on its own merits. It may be a good thing that I have forgotten what IRIS was all about except the fact that it made me rediscover LBH and erase my ugly image of him in BUNGEE JUMPING OF THEIR OWN. LBH and KTH delivered decent work in IRIS that further boosted their careers. 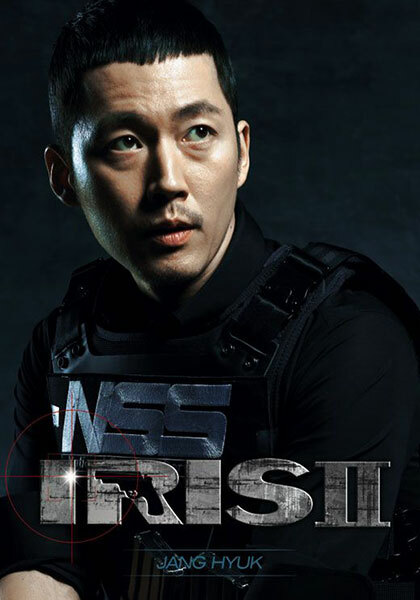 But so are Jang Hyuk and Lee Da-hae giving equally good performances in IRIS 2. It’s a bad sequel, full stop. It’s all about the romance angle, more talk and less action. Why are the women the ones firing guns? What happened to the men? I do understand how some people are so allergic about the idea of sequels that when they hear about it, they get rashes all over. I’m one of those (not the rashes part though) especially when it comes to films or dramas that I love most like, say, INFERNAL AFFAIRS. So I don’t really blame those who scoff at a sequel to one of Korea’s most recent beloved spy dramas. But to say IRIS 2 is a shame to the original is unfair, especially when one has not gone even beyond episode 1 to see what it is all about. Good thing the finale is on Thursday so we don’t have to keep on going around the story on the secret that Baek San holds, what the North will do with its nuke development and what the South will do with the missiles it now possesses, will there ever be reunification and who’s the double agent or who’s spying on who. Even the internal politics and power play involved at the NSS (National Security Service) has become very redundant. Without the romance angle, it would have been totally dry. Love makes the world go round, right? And even spies deserve to fall in love. Now, that third complaint is really perplexing especially when it’s fanGIRLS complaining about how women are getting all the action. I guess in dramaland, there is no such thing as emancipation for women. Women are just supposed to look pretty like delicate vases and stand aside and wait for prince charming or let the men do all the action. How pathetic. We complain about how women are portrayed in dramas and yet when they are given something more to do beyond crying and moping, we complain. Make up your mind, fangirls! Sure, we watch dramas as a form of escapism and entertainment. And those are the very reasons why despite the glaring lapses, IRIS 2 still works for me. It’s obvious that the production, particularly the action scenes, are done more for cinematic effects than realism. Example: Let’s do a chase scene in the snow in Japan! Have the goons ride snowmobiles and let Jang Hyuk fall from a bridge to a river below. How awesome! Discuss work and security arrangements of the upcoming peace talks at a sidewalk cafe in Hungary. Yeah, for everyone to hear. Have a “clandestine” meeting in a cafe (insert product placement here). Go on a mission unarmed and without a back-up. Don’t they operate on a buddy system? What are you, supergirl? Let a very important asset–who holds crucial information on nuke weapons–roam around freely without anyone bothering to know his whereabouts. The signal was lost? No problem. Just let him meet the love of his life, who is still alive after all, and let her die in his arms. How romantic. Let the team leader of the anti-terrorist mission go missing for nine months without even having a lead on where he is. Don’t you have a network of contacts? If you have anti-terrorists like this, we should really be afraid of terrorists. Let criminals escape–no matter how badly wounded they are, and no, they never die, no matter how many times they are shot–just like that because the good guys are not meant to catch the bad guys just yet. That is reserved for the finale. Maybe. Or a part three. Seriously, how many times did I utter: “no wonder North Korea gets away with all its saber rattling”. But then, this is not real, and what a relief that is. But then again, artistic license is king when it comes to drama productions. You want realism? You can get that from the news. Who’s complaining? Not that I’m complaining–just listing down the quibbles I have with this drama–because once you get into the groove of IRIS 2, you’d enjoy the ride. Jang Hyuk as Jung Yoo-gun provides a strong anchor for the drama. He especially shines in those episodes where he lost his memory and brainwashed by IRIS. He gives a heartbreaking performance of a man who does not have any memory of his past and does not know who he is, and is just existing like a puppet of a terrorist organization. I used to be ambivalent towards Lee Da-hae but she’s actually likeable. One of her highlights is when she finally sees with her own eyes how the love of her life has become the enemy, and he even shoots her. I’m surprised that this is her third time to work with Jang Hyuk because they looked like an awkward couple in the first few episodes. Off the drama and on this variety show, they showed a lot of chemistry and appear to be close they even go to KTVs together, and she knows a lot about him and calls him “oppa”. Oh no, my shipper heart, be still. Anyway… the support cast is also good particularly Baek Sung-hyun who plays Kang Byung-jin, one of the computer geeks in the team. He’s cute all right, but he gives an earnest performance. It’s also very interesting that there are two members of pop idol groups in the cast: Beast’s Yoon Doo-joon and MBLAQ’s Lee Joon. Yoon Doo-joon gives the more solid performance as an earnest agent who is both close to the two leads, but is later suspected of being a double agent. This boy can do drama. Lee Joon, on the other hand, gives a rather annoying performance but perhaps it’s because his character is meant to be annoying. So does that mean he is good at, er, being annoying? He reminds me of Rain, his sulky acting and all, it makes me wonder if he got acting tips from MBLAQ’s “mentor”. So if this was a proxy war between Beast and MBLAQ, I’d say, Beast wins. And now I regret why I didn’t go and cover a recent Korean pop festival here where they were one of the performers. I’m really looking forward to the last two episodes this week and I think I’d watch the earlier episodes again, now that I know what I know from the later episodes. For someone who works in news and has North Korean nukes news fatigue, watching IRIS 2 may already be quite a stretch but I suppose that’s the appeal for me. How reel and real mix. I’ll have some YELLOW tea while I re-watch the previous episodes.